The Rossville Moravian Lodge was organized in 1903 with the first meeting held on February 7, 1903, in the 101 Victory School House. Meetings were held there until 1909 when the members were able to finance their own building. Since then it has been remodeled and enlarged. This picture of the Moravian Lodge No. 128 members was taken at Lodge Hall northeast of Rossville, Kansas. 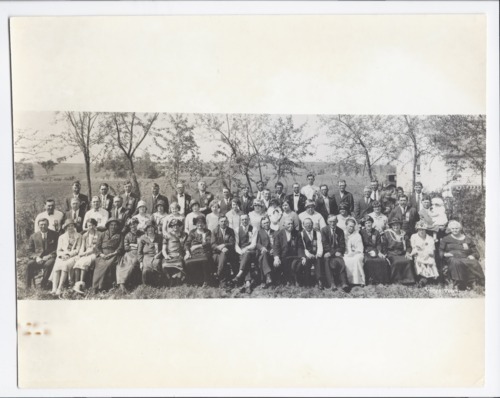 Pictured left to right are: front row: Frank Matyak, Alice Cerny, Carrie Cerny, Mrs. Anton Macha (Frances), Mrs. Thomas Cerny (Katherine), Mrs. John Kovar (Anna), Mrs. Frank Stach Sr. (Frances), Mrs. Paul Kovar (Frances), Frank Hromada Sr., John Kratina Jr., Thomas Cerny, John Kratina Sr., Frank Dolezilek, Anton Macha, Mrs. Joseph Cerny (Henrietta), Mrs. Martin Stach (Anna), Mrs. Vince Probislo (Marie), Mrs. Thomas Smatla (Marie), and Mrs. Matt Rezac (Mary); second row: Frank Kratina, August Stach, Henry Cerny, Emial Kovar, Mrs. James Koci (Frances), Mrs. Frank Matyak (Frances), Tony Dolezilek, Lydia Dolezilek, Anna Dolezilek, Sophia Hromada, Mrs. Fred Koci (Pauline), Blanch Martinek (child), Mrs. Albert Martinek (Frances), Mrs. Joseph Badura (Marie), Mrs. Frank Hromada (Tressie), Mrs. James Rezac (Victoria), Joseph Badura, and James Koci with child; third row: Albert Martinek, Henry Badura, George Olejnik Jr., Frank Stach Sr., Henry Galicheck, Matt Rezac, John Kovar, Vince Probislo, Steven Martinek, Joseph Krasney, Paul Kovar, Thomas Smatla, Joseph Cerny, Ignac Horak, George Olejnik Sr., James Rezac, Anton Zemek, John Bravence with child, and Frank Cerny. Not pictured are Mr. and Mrs. Vince Martinek. This photograph is provided through a pilot project to host unique cultural heritage materials from local libraries on Kansas Memory and was accomplished by mutual agreement between the Northeast Kansas Library System, the Rossville Community Library, and the Kansas Historical Society.